Braves players celebrate after pitcher Sophie Low, left, recorded a strikeout during Thursday’s OCC showdown against visiting Westerville Central. The first six batters reached before an out was recorded in the first inning as the Olentangy softball team overcame a 2-0 hole with five runs. Olentangy (10-6, 4-0) added on from there and rolled to a 10-2 victory over Westerville Central to take a two-game lead in the loss column in the OCC-Buckeye standings with Thursday’s win in Lewis Center. Sophie Low continued her solid season with a complete game to pick up the win in the circle. She gave up a lead-off walk to Kylie Collins, followed by two-run homer by Avery Schumacher and a Cami Compson walk in the first inning. Low settled in after that, allowing just two hits over the final six innings of work aided by some solid defense. 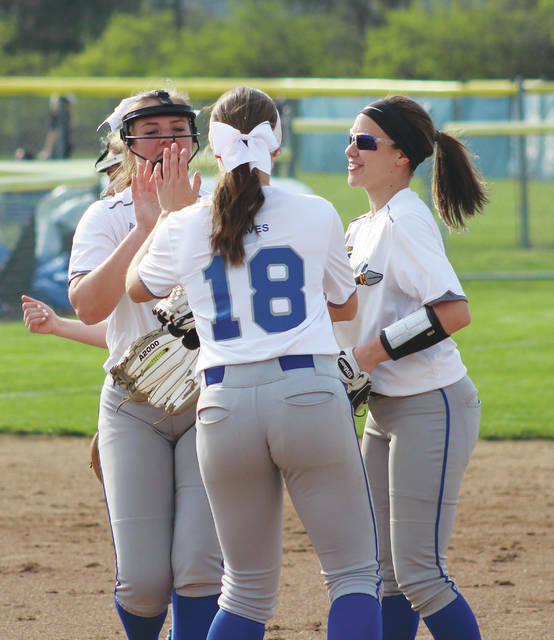 But, it was Olentangy’s first-inning barrage that helped settle Low. Olivia Davidson led off with a double and Morgan Cox followed with an infield single and stole second to set up Payton Cox’s two-run single to tie the score. Emily Bullock singled and Low followed with a RBI single for the lead before Kirsten Kracht ended the rally with a two-run single to give Olentangy a 5-2 edge. Low added RBI singles in the second and fourth innings and Payton Cox drove in a run on a double in the fourth. And they made some plays. Davidson snared a rocket-shot off Compson’s bat that would have scored Schumacher, who had doubled and moved to third on a wild pitch earlier in the inning. Olentangy had a five-run lead at that point. Schumacher, who led the Warhawks with two hits, almost had a third extra-base hit when she sent a deep drive to center that was caught by Olivia Gregory crashing into the wall to end the fifth. This should have been to decide the league title (and it still might). But, Olentangy has only played four league games after postponing four others because of weather or field conditions. Stepp took the loss for the Warhawks (8-8, 5-2), allowing nine runs (seven earned) on 10 hits and two walks over four innings. She had six strikeouts. Next up, Olentangy hosts rival Olentangy Liberty in league play today at 5:15 p.m. Follow Michael Rich on Twitter @mrichnowealthy or contact him at mrichnotwealthy@gmail.com.